Ed. Note: This review is based on the pre-restored version of the film. After achieving an enviable level of success during the first part of his career, by the early to mid-1960s Kon Ichikawa’s popularity was already on the wane. Following several box office failures, one of them being “Enjo” (1958), he was commissioned by his studio Daiei to direct an adaptation of famed silent film auteur Teinosuke Kinugasa’s “Revenge of a Kabuki Actor” which would star Kazuo Hasegawa in his 300th film appearance. Given the assignment to turn a 30-year-old silent picture that no one was clamoring for a remake of, Ichikawa was emboldened to experiment and visually push the boundaries that separated theater and cinema. Utilizing Daiei’s version of Cinemascope, “An Actor’s Revenge” (1963) is a stylistic cornucopia of sound and color. Framed as a revenge story through the prism of a kabuki play, Ichikawa never falters. He, his Director of Photography Setsuo Kobayashi, and Art Director Yoshinobu Nishioka fully embrace the tropes of kabuki but don’t merely film it straight. One example is the incorporation of elaborate stage design as part of the narrative drama, just as in kabuki. Shot mainly on a sound stage, the film revolves on several key interior scenes wherein Hasegawa, playing the oyama protagonist Yukinojo, either plots or enacts his revenge on the three coldhearted merchants that drove his parents to madness and ruin when he was a boy. Each interior set though is dressed in a fashion that mimics the personality of the character who inhabits it. For example, Sansai Dobe (Ganjiro Nakamura) when we meet him in his room/office is bathed in glowing gold light and placed around him are a few tokens of wealth and power. The merchant Hiromi (Eijiro Yanagi) on the other hand is seated in a room filled with trinkets, expensive baubles, and Western items like clocks and chairs. A comparison of these two rooms reveals so much about both characters. Dobe who is in a position of power has no need to trumpet his wealth whereas Hiromi, insecure in his status, props himself up to his guests. When Hiromi gains in prestige later on in the film after stopping the rice riots in Edo, the character moves away from the cluttered office and moves into a room very similar to Dobe, down even to the yellow gold light which bathes him, to visually illustrate his ascendance up the social ladder. The stylized set design continues when the story moves outside. During night scenes, Kobayashi blacks out large chunks of the scenery, spotlighting only key characters and props, forcing our eyes to only focus on the information Ichikawa wants us to see. This technique is often excessively used, especially when characters are either chasing someone or engaged in battle, yet it works because this Brechtian use of shadows and darkness further illustrates the artificiality of the story itself. Forcing us to question whether what we are seeing might possibly be a play within a play. This sentiment can be further seen in the characters and plot that for the most part left me cold even as several tragic moments occurred in the film. 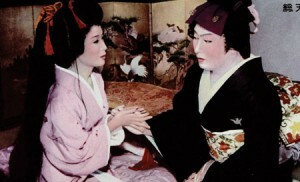 Since the source material for this remake originated from a newspaper serial written during the late to early 1930’s, it’s reasonable to say that the Japanese audience watching this film during its original premiere would be familiar with the story and also with the traditions and tropes of kabuki itself. If this is the case, then Hasegawa’s flamboyant performance as an onnagata, a male actor who played female roles in kabuki plays, makes absolute sense. In a naturalistic drama his portrayal of Yukinojo would vacillate from feminine when onstage performing and then masculine once he takes the make-up off. Yet in “An Actor’s Revenge,” Yukinojo never removes his make-up or costume, and thus never stops being Yukinojo – an identity he took on when he joined the kabuki troupe – throughout the picture. This again proves that the film is less a revenge story, and more a deconstruction of kabuki and an exercise in adapting theatrical techniques for a cinematic medium. Aside from this, there is also the matter of the anachronistic soundtrack that often utilizes modern jazz tracks to punctuate scenes which also adds to the artificiality of the film itself. Only a few years after the completion of “An Actor’s Revenge,” the collapse of the Japanese studio system left Ichikawa unmoored and unable to direct with any commercial or critical success until the late ‘70s. However, this film proves that during his heyday Ichikawa was the equal of any filmmaker of his generation, and even now, due to his fearless embrace of tradition and capability to break the rules when necessary. As in most of his early work, “An Actor’s Revenge” requires its audience to give in to the film and not the other way around. The restored version of “An Actor’s Revenge” screens in 35mm at the Japan Society in New York on Sat., Oct. 17, at 7 p.m. as part of a three-film series on Kon Ichikawa. For ticket information, go to japansociety.org.